I can’t believe Halloween is right around the corner! While I am super excited to decorate my house and get into the holiday season, I am most anxious to check out Mickey’s Not-So-Scary Halloween party this year. This is by far my most favorite hard ticket event that Disney has to offer, so if you haven’t experienced it for yourself, grab your to-do list and write it down! There are so many special events and activities for all ages during this celebration that you won’t experience during any other time of the year. From special character meet and greets, to the parade and awesome eats, Mickey’s Not-So-Scary Halloween Party is the place to be this fall! This year, Hocus Pocus will make its debut on the main stage and the Sanderson sisters are making an appearance with all of the Disney villains! This is a treat since it has never been done before, so I am most excited for this great event! There are several fun and special activities and shows planned for the party, and you’re not going to want to miss any of it, so I am here to share my tricks as to how you can enjoy all the fun the party has to offer, without missing any of it! 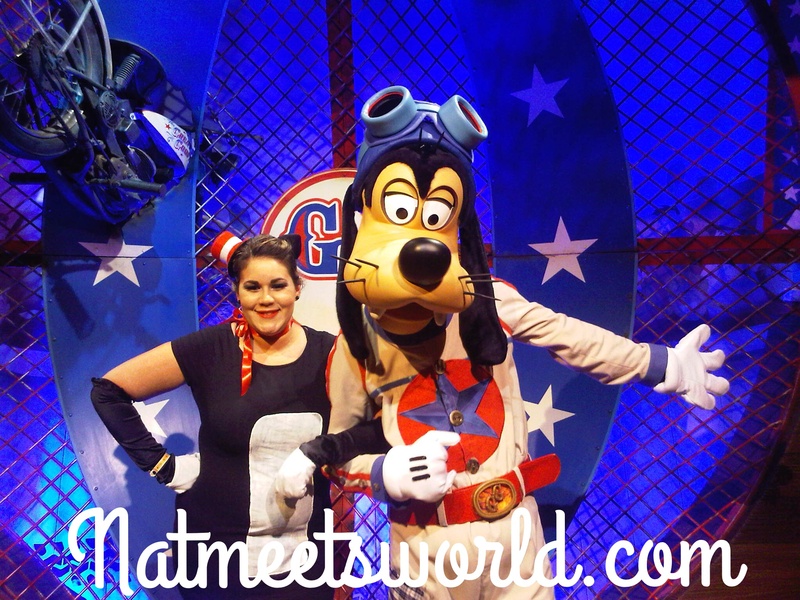 Check out my top 5 tips and tricks for the best way to enjoy Mickey’s Not-So-Scary Halloween Party! 1. Buy Your Tickets Early! Make sure to purchase your tickets before you even schedule your visit. There is a good chance that if you wait to purchase your tickets at the gate, they will be sold out (halloween day is already sold out). Annual pass-holders, DVC members, & Florida Residents are given discounts, so be sure to mention this when purchasing your tickets. You can call or go online (on the disney World website) to purchase your tickets. Although the festivities don’t begin until 7:00 PM, you are allowed to enter the park around 4:00 PM. This allows you to enjoy three more hours of fun! During this time, I like to take advantage of riding some of the rides , since my time during the party will be consumed with the special Halloween events. Select your FastPasses on your My Disney Experience App, and head over to Magic Kingdom early to check out the rides before the fun begins! Most (if not all) rides are available during the party hours, so you will be able to enjoy some f them if you don’t get to see them from the 4-7 PM hours. Speaking of rides, be sure to visit The Haunted Mansion and Pirates of the Caribbean to experience the cast members with special makeup. I also like to take this time to take pictures around Main Street U.S.A since it is decorated for the season. Be sure to grab a map and review it so that you are prepared as to where all of the shows, candy stations, and character meet and greets will be. While you’re checking out the characters that are available for meet and greet, be sure to visit the most in-demand characters (like Sally and Jack) first before the lines get long. There isn’t any other event at Walt Disney World that lets you dress up in a complete costume other than Mickey’s Not-So-Scary Halloween Party. Take advantage of this, and dress up as the character you’ve been wanting to be! I love seeing how creative families get with their costumes, and my jaw pretty much drops every time I see the most original and well throughout disguises from park guests. I also love seeing Mickey, Minnie. and their friends dressed up in costume as well. 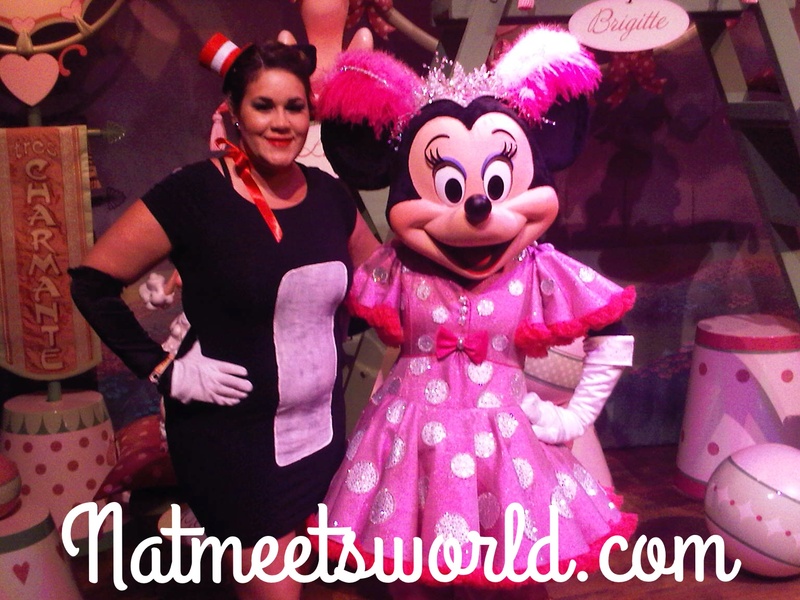 Having the characters in costume as well makes for great picture and meet and greet opportunities. 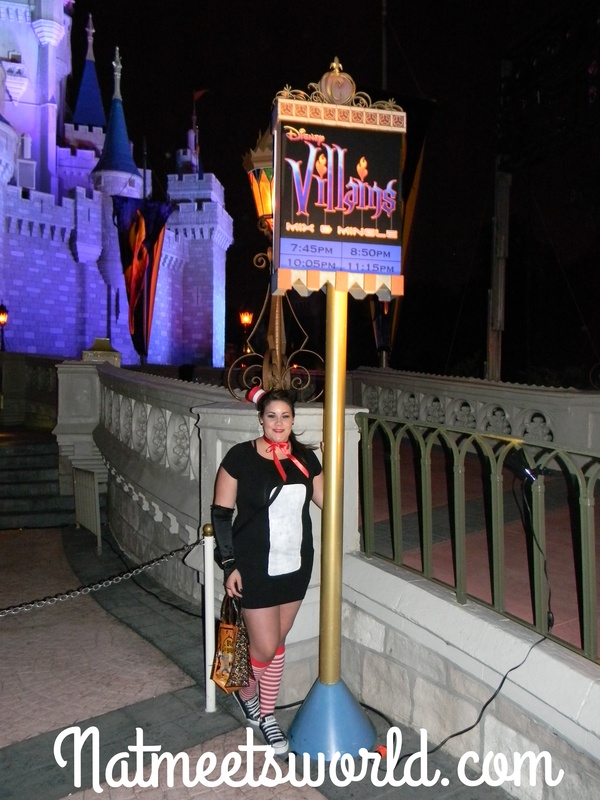 Dressing up is part of the fun, so if you are not into dressing up, get out of your comfort zone and get in the Disney Spirit with your costume. I guarantee you are going to love it! Please check the Disney World website or call for a complete list of the costume requirements before selecting your costume. Also, be sure to choose a costume that you will be comfortable walking around the park in for more than a few hours. There is nothing fun about being uncomfortable! There are several trick or treat stations around the park to collect some great candy. Make sure you bring an extra bag (or purchase one in the park) so that you can enjoy taking your candy back to your hotel room and enjoy it for the rest of your trip. The cast members do hand out bags for this, however, with all of the candy we received, it wasn’t enough. I was grateful to have my reusable bags that I purchased before the event. If anyone in your party has any kind of allergy or are on a gluten free diet, be sure to inform a cast member, so that they can accommodate your needs. There are two ‘Boo To You’ parades during this event. They are both exactly the same, and include the infamous headless horseman (which is a definite must see). I highly recommend that you attend the second parade, since the first parade tends to fill up completely, leaving no room to sit and enjoy it. Most park guests attend the first of every show or parade, so just hang tight as the first one passes by, and enjoy the second one with a smaller crowd. I’m waiting for the show to start! This show is great and features some very rare appearances by villains that you don’t see too often, as well as songs and dances that are not performed during any other event. With the inaugural year of including the Sanderson sisters from Hocus Pocus, I imagine the crowds will be even larger than ever. I also recommend that you check out the later shows due to the huge crowd for the first one. There are four shows throughout the night, so the later the show, the smaller the crowd. After the show, some of the villains will descend the stair case and allow the guests to meet them and take pictures. If you are thinking you are going to meet every villain, it is not going to happen since they are only out for about 15 minutes after the show ends. Since some guests take a while talking to the characters and taking pictures, you will need to get in line quick in order to have a chance at meeting a villain. As soon as you see them walking off the stage, choose one villain you really want to take a picture with and follow them as they walk off the stage. Wait in line in front of them, and hopefully you will get a chance to meet them. 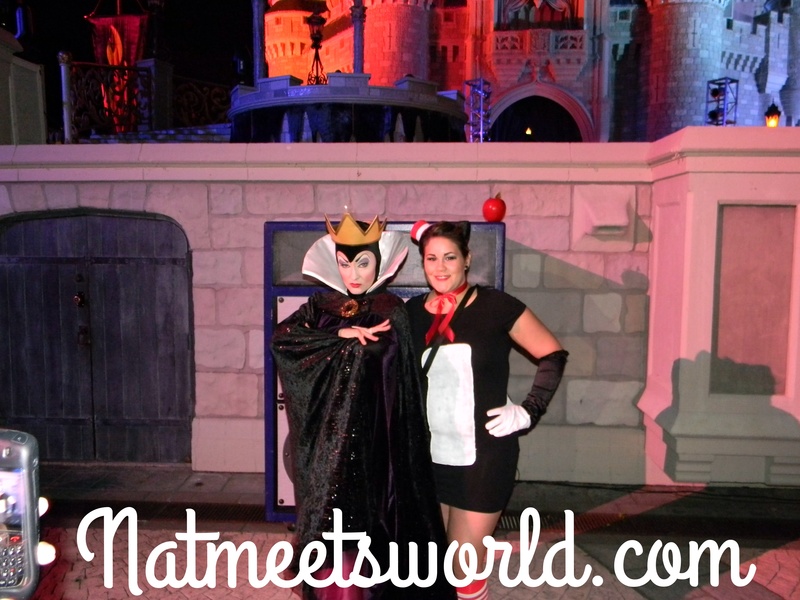 I was lucky enough to have met my favorite, the Evil Queen! After the Villains Castle Show! The end to your night is hosted by the Ghost Host from the Haunted Mansion. He will kick the finale off with Disney Villains and there theme song and illuminate the sky with a special firework show. Make sure to snag a spot on Main street U.S.A to enjoy this finale before returning home for the night. This will start around 9:45 PM. Enjoy sweet treats and fantastic viewing areas for the amazing Hallowishes Firework show with a private dessert party at the Cinderella castle. This event is truly one of a kind and a great way to spend time with family while watching the fireworks. For more information on booking this event for your family, check out the Walt Disney World Website and call an agent to reserve. While everyone is attending the first parade and the first Villains show, head over to the locations where characters are doing meet and greets! The lines will be short and the chances of you getting to meet all of the characters will be at an all time high! When I went to the circus tent in Fantasy Land to meet Mickey and his friends during the first Boo-To-You parade of the evening, there was only a 5 minute wait, and I was able to meet everyone! There are several dance parties around the parks. Whats great about these is that different characters go out into the crowd and boogie down with you! Be sure to review these locations and times on your map! Let me know if you attend the party this year! Have anymore tips to add to this list? Comment below! 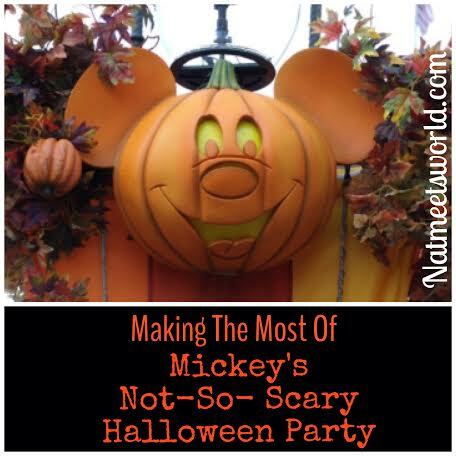 I hope these tips assist you with making the most of Mickey’s Not-So-Scary Halloween Party!